ZP3 is Ampco’s bestselling PD pump. It’s cutting-edge design is fully CIP-able while maintaining maximum efficiency, ease of maintenance, and greater productivity. Ampco’s patented design provides best-in-class cleanability. Available with great standard features including a stainless steel gearcase, this pump is a durable, reliable powerhouse. Enhanced with a PTFE double lip seal configuration, ZP1 is ideally suited for sanitary, industrial and chemical applications. The patent-pending ZP1+ begins with all the ZP1 benefits and adds an enhanced front loading O-ring seal design for easy maintenance. With ZP1+, achieve maintenance cost savings by not having to remove the pump from the piping. The ZP2 offers a larger shaft and is capable of withstanding pressures up to 450 PSI. The stainless steel gearcase – as with all Ampco positive displacement pumps – means no paint or rust flakes on processing room floors. Well suited for low and high viscosity applications, Ampco’s ZP Series are top-of-the-line, 3A Certified positive displacement pumps. The ZP Series circumferential piston pumps consistently provide low vibrations and good mass balance – and are specifically designed for performance excellence and extremely tight tolerances. 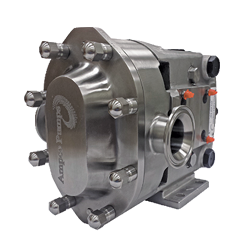 Versatile enough to fit the most demanding sanitary application, Ampco Pumps offers 36 ZP models with 12 companion models featuring a variety of rectangular flange configurations. 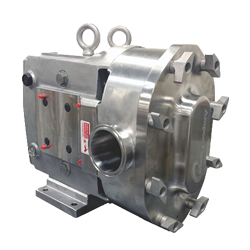 The full line of Ampco ZP positive displacement pumps have been developed to accomplish customer application needs as their first objective. Each model includes features that translate to value, efficiency, and longevity. 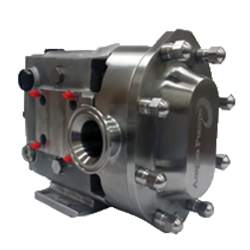 If one of our nearly 50 circumferential piston pump options does not fit your specific sanitary application, put our fully staffed R&D lab to work on tailoring a pump for your specific configuration. The Ampco patented ZP3 is an industry leader with full CIP-ability without loss of efficiency. All ZP Series serve as a “drop-in” replacement for competitive or OEM sanitary positive displacement pumps – and have a highly attractive price point. Ampco engineers have enhanced pump longevity by adding features like the stainless splash plate to reduce potential damage to bearings from water intrusion during the wash-down process – eliminating a major cause of bearing failure. Each model in the ZP Series lineup has specific features that are desirable for a wide variety of sanitary applications. For example, the ZP1+ features an enhanced O-ring seal that can be changed without disconnecting piping from the pump. 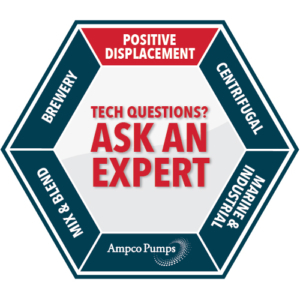 The Ampco Pumps team continues to redefine engineering excellence by offering customers the best sanitary positive displacement pump value and versatility in the marketplace. 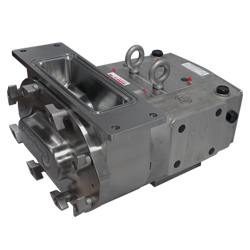 Our goal at Ampco is to set the bar in sanitary pump technology to increase ease of maintenance, extend performance, and extend the life of Ampco’s PD circumferential piston pumps. Need it tomorrow? Ampco has the BEST inventory and lead times in the industry.